The past year has been notable for the attention “fake news” has received. In the Middle East, however, fake news is old news. And the master of this is not Russia, but Iran, like reported by atimes.com. Indeed, Iran’s mischief making in the region is not restricted to sponsoring foreign militias. 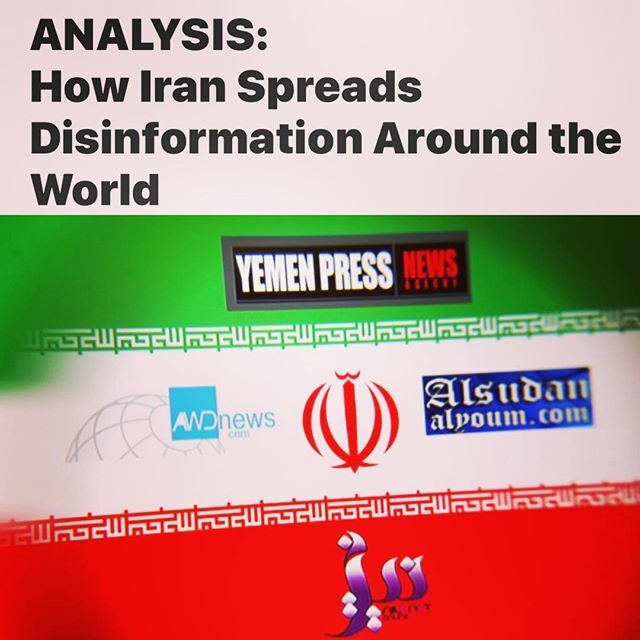 It also includes funding, supporting or encouraging dozens of Arab media outlets – satellite TV stations, websites and social-media accounts – that are managed by Tehran’s allies. These outlets do not only push the Islamic Republic’s positions, but create an echo chamber that has become a parallel universe. Their primary mission is consistently to hail Iran’s victories. As in ancient times, when victory was perceived as a sign of divine reward – and because the Iranian leadership views itself as the shadow of God on Earth – Iran can never stop winning, or at least be perceived to be so. Pro-Iran Arab media outlets last year reported on Iranian commemorations of the 38th anniversary of the start of that war by taking their cue from Iran. The Iraqi TV station Alitijah quoted Iranian General Yahya Safavi saying that US President Donald Trump was unaware of the Iranian victory over Saddam Hussein, for if he were aware he would not dare think of confronting Tehran. Iranian talking points expand their analysis to argue that the West has proved to be a paper tiger. In one of his Friday sermons, Tehran cleric Kazem Sadiqi saw an opportunity in France’s “yellow vests” protests to push the point that the liberal West has been a failure, and that the only true success is Iran’s Islamic model. France’s gross domestic product per capita stands at US$38,500, compared with Iran’s $5,400, another fact that Tehran’s pundits, both Arab and Iranian, conveniently sweep under the rug. Pro-Iran Arab pundits also peddle the point that Iran has been a world leader in technology, manufacturing and agriculture. Writing in the newspaper of the Iraqi Islamic Daawa Party, Ali Khayyat argued that “Iran is an industrial and productive country with modern technology.” Despite its bragging, Tehran had to beg foreign companies to develop its energy resources, such as Pars 11, a gas field that French energy giant Total dropped after US sanctions. The China National Petroleum Corporation (CNPC) then took over. Right before the last meeting of the foreign ministers of Iran, Turkey and Russia in Geneva, Mohammad Javad Zarif said the West had finally conceded and become willing to settle the Syrian conflict along the lines drawn by Iran. By the end of the day, pro-Iran TV Almayadeen and its website were reporting that it was America that obstructed a Syria compromise in Geneva. Hence the West had both conceded to Iran in Syria, while at the same time obstructing a settlement. In addition to their alternative facts and contradictions, Tehran’s media – both in Arabic and Farsi – selectively recognize news. When the UN Human Rights Council issued a statement denouncing Iran’s “severe” rights violations, Iran’s media outlets ignored it. Then, last month, when a committee at the Iranian parliament responded to the United Nations report, Iran’s Arabic media went ballistic. Yet they offered no uncomfortable background information that deviated from the standard script, so readers and TV news viewers had to settle for a story in which Iran rebutted a UN statement whose text and context remained unknown. Like Iran itself, Iran-funded Arabic media live in a parallel universe, often disregarding rules of journalism, disseminating propaganda and offering contradictory reports. The pro-Iran Arabic media outlets might be shinier than their state-run predecessors, but in terms of content, they offer the same controlled message that Tehran wants to spread, not only in Iran, but throughout the Arabic-speaking region. In a year in which fake news became news itself, Iran has been ahead of the curve. Unfortunately, not nearly enough is being done to counter the corrosive effects of Tehran’s active media distortions. It would be useful for world powers to resolve this new year to do something about it. 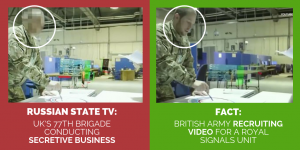 “Lies and blatant fabrications” – this was how the British government described Russia’s clumsy attempt to conceal its hand in the nerve agent attack in Salisbury, by staging a bizarre interview with the suspects. 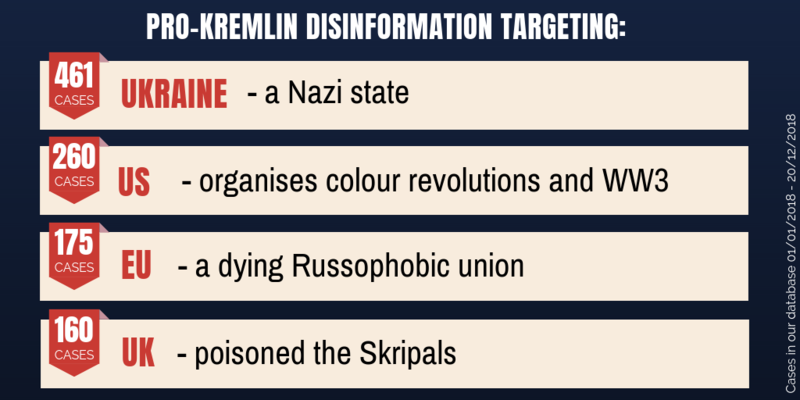 But it might as well be a by-line for the overall pro-Kremlin disinformation campaign that we followed in 2018, like reported by euvsdisinfo.eu. 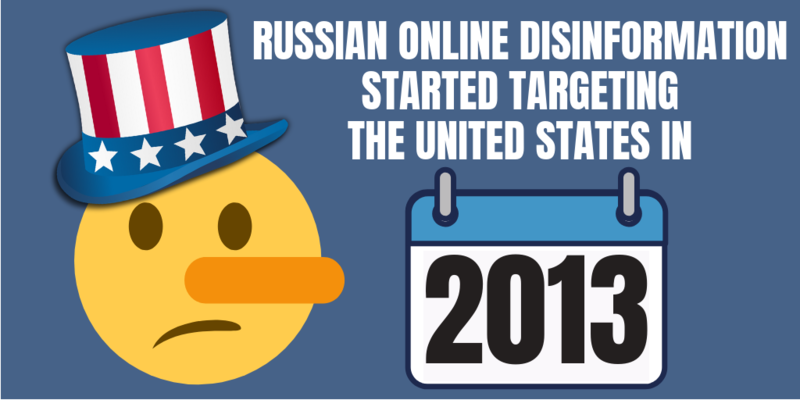 Russian online disinformation began targeting the United States as early as 2013 and efforts to manipulate Americans continue unabated, according to two new reports produced for the U.S. Senate, like reported by euvsdisinfo.eu. One of the reports was drafted by Oxford University’s Computational Propaganda Project and the network analysis firm Graphika. The other report was prepared by the social media research firm New Knowledge, Columbia University, and Canfield Research. The reports trace the origins of Russia’s online influence operations back to 2009, when the focus was initially on Russian domestic politics. The operations eventually expanded to include U.S. politics four years later. Attempts to manipulate Americans reportedly grew sharply in 2014 and every subsequent year, starting on Twitter and gradually spreading to YouTube, Instagram, and then Facebook. The reports also shed light on how Russia’s disinformation campaign used other online platforms such as Google+, Tumblr, and Pinterest as well as email accounts from Yahoo, Microsoft’s Hotmail service, and Google’s Gmail. They detail how Russian operatives began tailoring their messages to U.S. voters based on geography, political interests, race, religion, and other characteristics. Most of the analysed posts published in the run-up to the 2016 presidential election supported Donald Trump. According to the findings, more than 99 percent of all engagement on Facebook came from 20 pages all controlled by the Internet Research Agency, the infamous Russian troll factory based in St. Petersburg. The pages were primarily aimed at conservative and African American audiences. Together, they generated an estimated 39 million likes, 31 million shares, 5.4 million reactions and 3.4 million comments. The reports blame tech companies for their “belated and uncoordinated response” to Russia’s influence operations on their platforms. The problem was, however, that the interview, which appeared in a news broadcast on 21 November, turned out to be fake. The blogger had received a tip from one of his readers from Belarus who claimed to know the interviewee as a local to Minsk, the country’s capital. Mr Varlamov researched these claims and found two social media profiles belonging to a man from Minsk with a strong resemblance to the person who had appeared in the interview on Pervy Kanal. The Belarusian online outlet Nasha Niva quickly found the young man, who confessed to having been used as an actor. 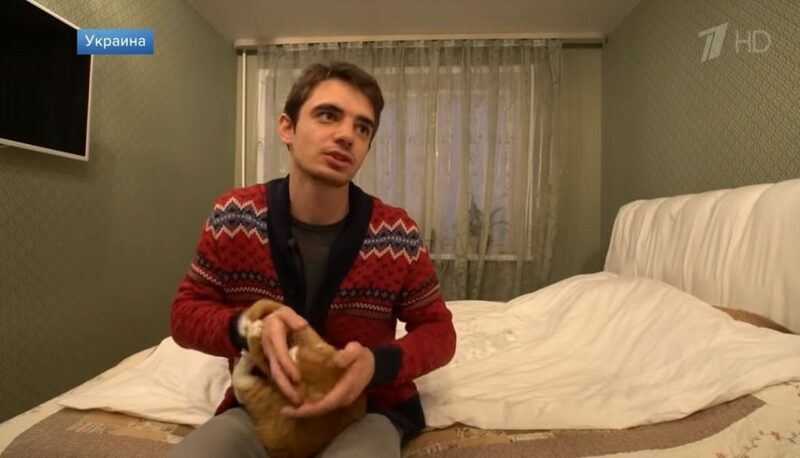 He claimed to be working for a media production company, which had been commissioned by Pervy Kanal with the instruction to “shoot a story about a family or person in Kryvyi Rih in Ukraine, who suffers from lack of gas and expensive heating”. Eventually, a Pervy Kanal spokesperson confirmed Nasha Niva’s findings in a comment to the Russian news agency TASS. The spokesperson blamed the production company but made no comment about why the TV station had requested a report with this particular content. Kremlin media is already notorious for using actors in interviews with “Ukrainians”. On July 12, 2014, Pervy Kanal showed an interview with a woman who was claimed to be a local of Sloviansk in eastern Ukraine. The woman described how she had seen a three-year child being crucified by Ukrainian nationalists while his mother was forced to watch. Journalists from the independent Russian newspaper Novaya Gazeta interviewed locals in Slovyansk within 24 hours and found that nobody had seen anything like what the Pervy Kanal’s actor had described. That she was an actor was reconfirmed when she later turned out to have appeared in other reports playing different roles. Other Russian state-controlled outlets have also used actors, including Rossiya 1 and NTV. It is also not the first time Pervy Kanal spreads disinformation. Follow this link to see other examples in our disinformation database. The US as the main actor behind the ‘yellow vests’ protests. Ukraine as the provocateur of war, preparing a chemical attack. Both got their part in the pro-Kremlin disinformation campaign this week. What a convenient way of shifting focus from the actors performing disinformation, like reported by euvsdisinfo.eu. 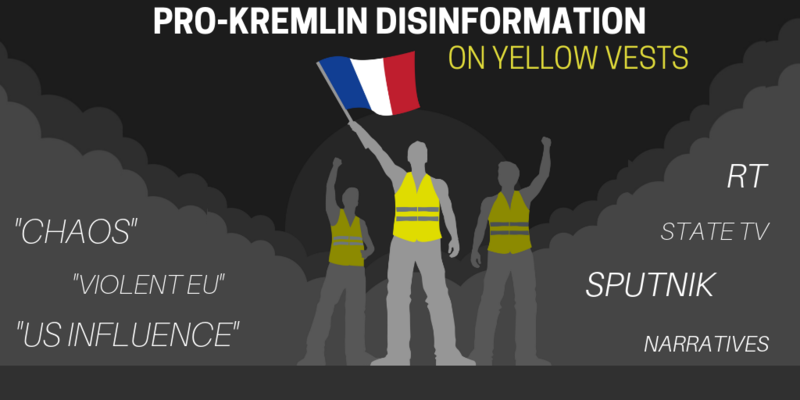 The attention of pro-Kremlin outlets was focused on the ‘yellow vests’ movement, with different disinformation angles having one aim: to sow confusion and a narrative about Europe in chaos. Many of our readers might have seen a video of French policemen taking off their helmets in front of the protesters in the city of Pau, in an attempt to calm the mood. The move was described by Newsfront, RT and Sputnik as a solidarity gesture with the protesters, with RT going further and saying that the police were now siding with them. The disinforming reports were based on the video and on a statement by a representative of the unions. In reaction, Bloombergoutlined that the union’s representative, while voicing support for protesters, was speaking for a minor French union. The disinformation about the solidarity gesture was debunked by several media, including the AFP. Only after that did disinforming outlets correct their reports. Another case from this week, about an armoured EU vehicle allegedly suppressing French protesters, perfectly fits the narrative about Europe in chaos (and possibly on the brink of civil war). The ‘news’ was debunked by Le Monde, saying that the EU flag on one of the vehicles had to do with its previous participation in European trainings. We have also witnessed a well-known blame game, with the US shown as the one provoking the ‘yellow vests’ protests, in the hope of weakening Europe’s position in the world. A classical move of pro-Kremlin disinformation, strengthening the picture of Europe in weakness, chaos and disarray. Unsurprisingly, the disinforming outlets do not report extensively about the related findings described by The Times and Bloomberg. Hundreds of social media accounts linked to Russia were extremely active last week, circulating messages focused on violence and (again!) chaos during the protests. Possible Russian involvement in amplifying the protests – denied by Russia itself – is now being investigated by the French authorities. What just happened? Did Russian state media decide to drop disinformation and replace it with democratic debate? Since when has criticism of the authorities been allowed on prime-time Kremlin TV? Click to watch the video below and see how the talk show host and other discussants giggle towards the end of the video when Leonid Gozman, a well-known opposition politician, openly criticises the Kremlin and its media, like reported by euvsdisinfo.eu. Judging from the reactions in the studio, Mr Gozman could just as well have told a dirty joke or reminded the others of an embarrassing secret. 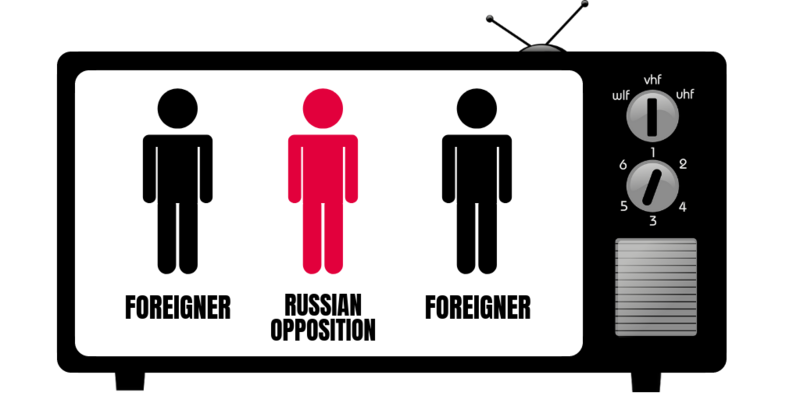 “Whenever I’m on your show, you always place me between two foreigners, to ‘show’ that I stand against Russia”. Worth noting is also that not all dissenters are as lucky as Mr Gozman when the only consequence he faces is smirking and giggling. Click here to watch examples of how e.g. foreign guests on Russian state TV talk shows have been interrupted, shouted at and even physically attacked live on air. The recording is from the talk show “60 Minutes” broadcast on 29 November. Click here for examples in our database of disinformation broadcast on state TV Rossiya 1. 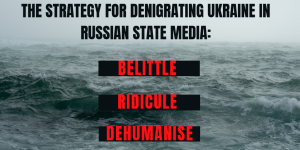 As the confrontation around the Azov Sea and the Kerch Strait has escalated, so has the disinformation as well as the rhetoric denigrating Ukrainians and their country in Russian state-controlled media, like reported by euvsdisinfo.eu. Denigrating language can, however, also include disinformation; one does not exclude the other. 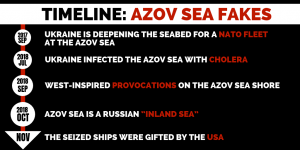 Last Sunday two of Russia’s most viewed TV channels told their audiences that the three Ukrainian vessels, which had been captured by the Russian side in the naval clash in the Azov Sea, represented one-third of Ukraine’s entire navy. “Our border guards coped brilliantly with the task. As a result, everyone is alive, and now almost a third of the active Ukrainian fleet is kept under arrest in [the Russian port of] Kerch. Ridiculous. Although it did create a lot of noise”. 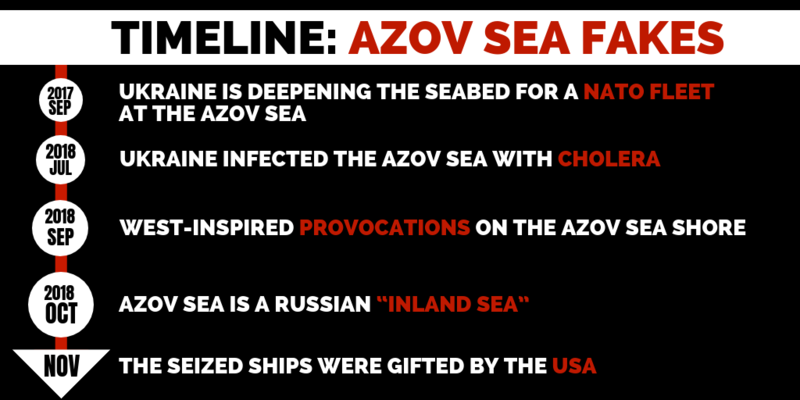 The independent Russian online outlet The Insider fact-checked these attempts to belittle Ukraine’s navy. Even if Ukraine lost 80% of its navy as a result of Russia’s illegal annexation of Crimea in 2014, it did not lose one-third of its remaining navy in the Azov Sea clash, but only one third of a particular type of vessels, The Insider points out. The Insider also found the wording in the two statements on Russian state TV oddly similar; this suggests it could be a result of the practice of disseminating centrally coordinated narratives from the Kremlin. This ridiculing of Ukraine’s navy echoes other cases when disinformation has been used to show Ukraine as weak and dependent. We have seen disinformation about the captured Ukrainian vessels being a gift from the US, which is not true, as well as a story about children in Mariupol being forced to dig trenches for Ukraine’s soldiers. 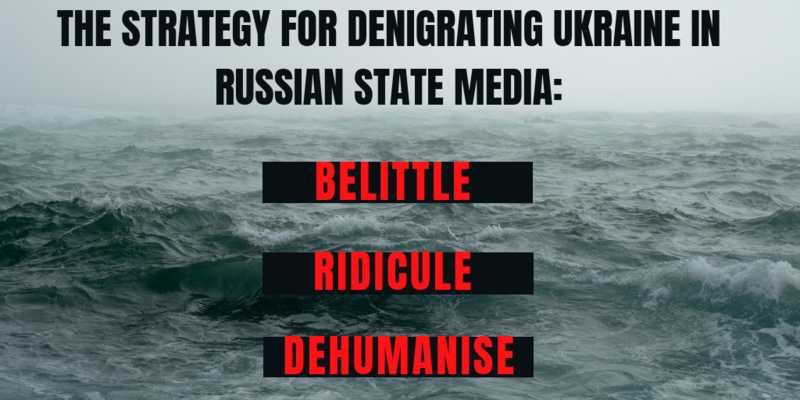 We have earlier described examples of dehumanising disinformation; allegations that Ukrainians steal food from pigeons in order to survive, stories about trade with human organs and about how students in Ukraine are allegedly forced to reject relatives who live in Russia are among the examples. The combination of disinformation and denigrating language serves as an example of how Russia uses communication as a hybrid form of aggression, which it in this case integrates into a military confrontation with a foreign country. It’s been described as a “death factory,” an “impregnable fortress” where the United States is conducting secret experiments on humans to create biological weapons aimed at exterminating Russians, like reported by euvsdisinfo.eu. Meet the Central Public Health Reference Laboratory, aka the Lugar lab, established in Tbilisi in 2011 under a U.S.-Georgian agreement to deepen bilateral cooperation on the fight against biological weapons. The laboratory has been in Moscow’s crosshairs since its foundation. And although Georgia is now fully in charge of its financing and operations, Russian media and authorities have tirelessly portrayed the facility as a cover for hostile U.S. activity in the region. 1) The laboratory is in fact a “military biological base” run by the U.S. Army. Georgian specialists have only limited access to the premises and no access whatsoever to information about the centre’s activities. 2) The lab is developing chemical weapons against Russia. The pathogens are powerful enough to kill 70 percent of the population in areas of Russia targeted by a potential U.S. chemical attack. 3) The lab was built close to the Tbilisi airport so that viruses can swiftly be loaded into planes and deployed as weapons. 5) The laboratory conducts secret experiments on humans and animals. The experiments have already killed 73 people. 6) People living close to the facility are at high risk of contamination from dangerous pathogens. As many as 5,000 residents are directly at risk. 7) Oncological diseases are on the rise in the area surrounding the laboratory and increasing number of babies are born with anomalies. 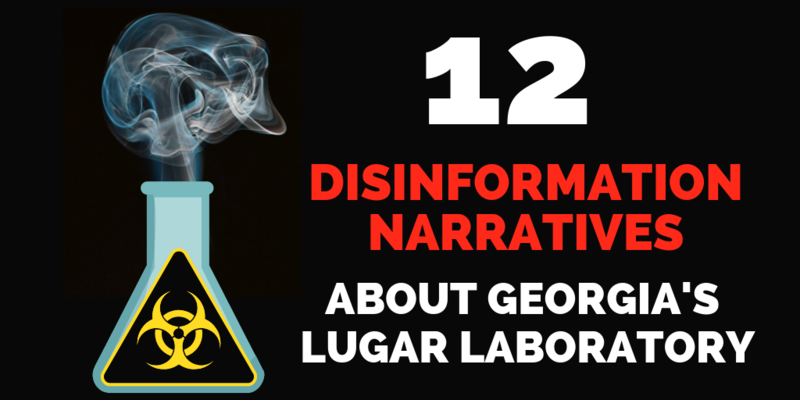 8) Contamination has already spread beyond Georgian borders. The lab has caused an epidemic of African swine fever in Russia. In September 2017, authorities in the Georgian breakaway region of South Ossetia — which Russia recognised following its brief war with Georgia in 2008 — expressed concerns about the lab and alleged a spike in “epidemic outbreaks of dangerous diseases” in South Ossetia. Russian state media, including Sputnik, have also accused the facility of spreading the H1N1 virus and other infectious diseases to neighbouring Armenia. 9) The drugs developed at the Lugar laboratory are able to trigger genetic changes in whole generations based on ethnicity. The incriminated medication, Solvadi, is in fact a treatment against Hepatitis C that has been registered in Russia since 2016. 10) The lab may be linked to a U.S.-patented device intended to release infected mosquitoes in targeted areas. 11) One of the reasons why the United States built the lab in Georgia is to fuel tensions between Tbilisi and Moscow. 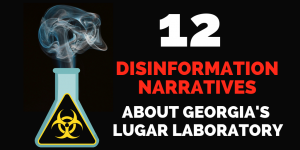 12) And because conspiracies often complement each other, the Lugar lab has been accused of involvement in the poisoning of former Russian spy Sergei Skripal and his daughter on British soil.